Dota 2 Template – Create items and characters for Dota 2 with our custom Dota 2 template, allowing you to create, preview and export all the textures needed easily! Particle Brushes – Throw water, dirt or even fire at your object and watch the realistic weathering effects unfold in real time! Material Painting – Paint full materials at once, lay the groundwork for your textures or paint small details in seconds! Smart Material – Reuse your materials to texture super quickly! Physically Based Viewport – Preview your painting in a next-gen viewport for accurate material feedback. Fully Non-Destructive – Modify your UVs or topology at any time without ever losing your work. 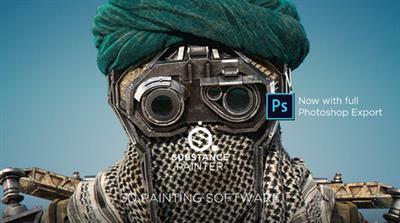 Substance Brushes – Use your Substances as brushes and unleash parametric painting! Multi-Material – Paint on the different texture sets of your mesh! Shelf – A dense preset library of materials, tools and effects that are tweakable, making the possibilities infinite.